Stacey's mom is gone since last year, and no one smokes cigarettes anymore. I feel so deeply hurt for my oldest friend to have lost her mother and so disoriented to be in this stage of life. Early 2000s, summer smells like the rest of the year -- recycled office air and burned coffee. We are all trying to adjust to the loss. Casual Friday becomes a thing. The mosquitos swarm my sweet-blooded girls and leave them swollen with bites. They sleep in scant pajamas and wake up with their skin scratched raw. A coating of Aquaphor has become a bedtime ritual as sentimental and essential as two songs, two stories. The girls are creeping toward that age when my summer snack and fragrance choices will be imprinted on their brains as permanent sense memories. Summer smells like the lavender soap I use to rinse their swimsuits, and popcorn when we splurge on movie rentals because the afternoons are too hot for outside. Still to come this summer: the warm smell of pool water and cedar when we move into Southfleet Motor Inn, Wellfleet, Massachusetts, for a week. Then, in August, the smell of Alabama petrichor when evening dew sets around Gran and Pawpaw's house. 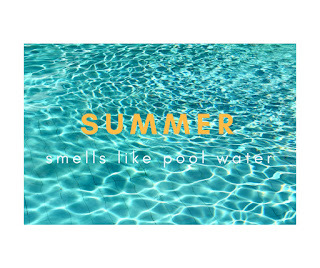 And maybe even the smell of pool water and cheese crackers from the vending machine at the city pool.